Patrick John Fox Barrett OBE passed away on 6 January 2015. He then served with the Colonial Service, Commonwealth Office and finally the Diplomatic Service in such places as the Solomon Islands, Nigeria, Malaysia and Italy. He was awarded the Order of the British Empire (OBE) while working at the British High Commission in Kuala Lumpur for services to British- Malaysian relations. His last overseas post was as British Consul at Venice. In 1994 he attended an Aux reunion in GHQ Coleshill along with Ron Hatchard and Ken Cleary, both no longer with us. In July 2000 he attended the National Reunion at the BRO Museum in Parham, Suffolk with his wife Veronica. He passed away peacefully at home with his wife by his side. Patrick Barrett OBE, ready to serve when called. By Evelyn Simak & Adrian Pye. John Everett came from an old Norfolk farming family. His grandfather had owned Old Hall Farm in Cley and his father farmed at Thwaite Hall Farm (near Aylsham), where John grew up. After the war, he was manager of Lodge Farm in Southrepps, a farm which he later bought in partnership and subsequently became the owner of that farm and the adjacent Froghall Farm in Northrepps. After his retirement, John and his wife Shirley moved to Blakeney, where he dedicated much of his time to gardening. He also was a fine shot, a keen cyclist and a tireless walker. He also read extensively, especially biographies. John had the ability to make friends wherever he went and there can be few who knew, or had some connection with, so many people in North Norfolk. Most of his friends, however, would not have known that during the war John had been a member of Auxiliary Units. After war had been declared John, under-age and unknown to his parents, joined the Alby and Thwaite company Local Defence Volunteers which later became the Home Guard. The members were initially armed only with pick axe handles and personally owned shotguns. At the age of just 17 John was promoted to Lance Corporal. Still only 17 in the autumn of 1941, John was approached by local farmer Alex Scott about joining Auxiliary Units and soon became a member of Alby Patrol in Norfolk Group 3. He was issued with a standard set of AU clothing, consisting of battle dress, great coat, army regulation boots, ankle-length rubber boots for walking quietly, webbing, camouflage scarf, gas mask and a tin helmet. The weapons initially issued were a Smith & Wesson .38 revolver for each patrol member, rubber truncheons and commando daggers, and some members also had a knuckle-duster. In addition they had a Thompson submachine gun (carried by George Wolsternholm), a P14 .303 rifle and a .22 single-shot rifle fitted with telescopic sight and silencer. As the best shot in the patrol, the .22 rifle was assigned to John to be used as a close-range sniper rifle. Until then John had had no idea that such a thing existed nor that Alex Scott was a member of such a unit. Within 30 minutes of signing the Official Secrets Act the other members of Alby Patrol had turned up for one of their twice-weekly meetings at the OB. John knew all four of them personally but had had no idea that they were part of a “secret army” prior to this. At the time the patrol consisted of Sgt Alex Scott, George Wosternholm, David McKay, Alec Cargill and a Mr Parish (transferred out – replaced by John Everett) They were shortly afterwards joined by Leonard Daniels who was transferred from Matlaske Patrol. We have enjoyed John and Shirley’s hospitality in their Blakeney home on several occasions and John very generously and patiently shared with us his memories. The information John kindly shared with us was always given after careful consideration and it has always been reliable. When John was not sure of something he would say so. Nevertheless, some of the information contained in his memoirs, made available to us by John’s widow Shirley after his passing, came as a huge surprise to us and has resulted in filling a number of existing gaps in the history – not only of Alby Patrol but concerning Norfolk Auxiliary Units in general – that we had so far been able to gather, and for this we are immensely grateful. John was amongst the patrol members selected for advanced training and he recalls attending six 1-week courses at Coleshill. The training generally consisted of observation skills, map and compass reading, navigation by the starts, new developments in underground warfare and sabotage. 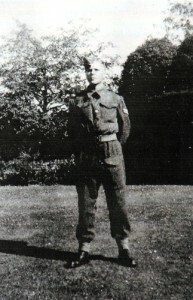 All of John’s training at Coleshill had been completed by the end of 1943. About four days before D-Day (Operation Overlord) John and several other local Auxiliers received orders to be at Eagle Corner, Erpingham, to be picked up by army transport. They were taken to Norwich railway station, and once aboard a train their sealed orders were read out to them. They learnt that they were being sent to the Isle of Wight, with no further explanation being provided. On their arrival the men from Norfolk Group 3 soon discovered that Auxiliers from all over the country had been sent to the Isle of Wight and they were informed that they were to join regular army units, and with them form anti-invasion patrols in case of a German counter attack. John was allocated to accompany a unit of Welsh Borderers to be stationed at the village of Freshwater where they were soon joined by members of the Durham Miners Auxiliary Units. On D-Day, John could clearly see part of the invasion fleet leave the Solent and later he heard the bombing and shelling on the Normandy beaches. He could see the pawls of smoke on the horizon and aircraft and ships gong and coming from France to England. After having spent three weeks on the Isle of Wight the Auxiliers were relieved of their duties and replaced by others. After stand-down all equipment and explosives had to be returned and the army took all the items from the OB. Like all the other patrol members, John was visited by Captain Duncan (Norfolk Group 3 CO) and Alfred Barrett (their Quartermaster), who collected personal equipment including side arms and uniforms. About three months later he received a small enamel lapel badge which he has kept in a safe place ever since. After a party held at Stuart Hall/Suckling Place for the Norfolk Auxiliers the men were finally able to resume their everyday lives. 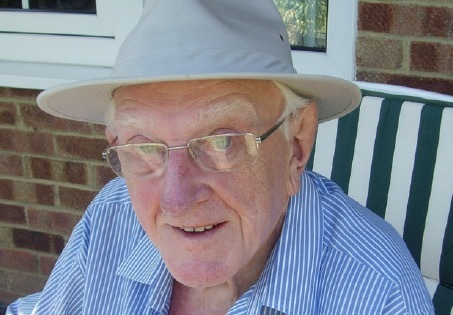 John Everett passed away on 3rd March 2012 after a short illness. He was laid to rest at Stiffkey, in the churchyard he had tended together with his wife Shirley for the past 14 years. The photograph at the top of the page shows him in 1943 in the garden of Thwaite Hall Farm.